Lookie what happened this morning! 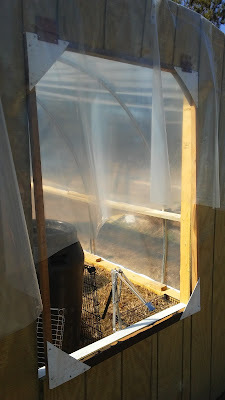 The plastic went on the hoop house. It's much thicker and sturdier than last year's plastic. It's also more clear and see-through. He'd already put on the channels and used wiggle-wire again to make the plastic sheeting fit tightly. This new hoop house is about the same height as the last one, but it is four feet longer and three feet wider. So there's room in the middle for a little aisle. Adam plans to put these three barrels in there with boards on top to make a table top down the middle. The barrels are a bit too tall for that, so he will bury them in the ground a little. 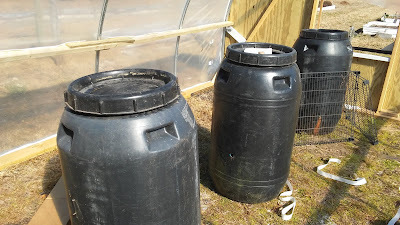 If the barrels are full of water, it helps the greenhouse to maintain a better temperature. 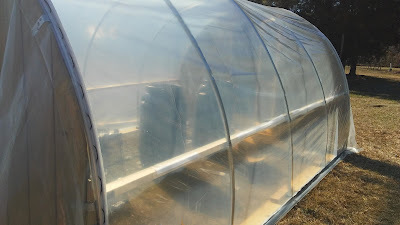 The hoop house will also have shelves down both sides like last year. One improvement is the back window. Adam framed a real window with plastic sheeting instead of glass. Last year he bought this neat window-opening device on sale. It's temperature controlled. 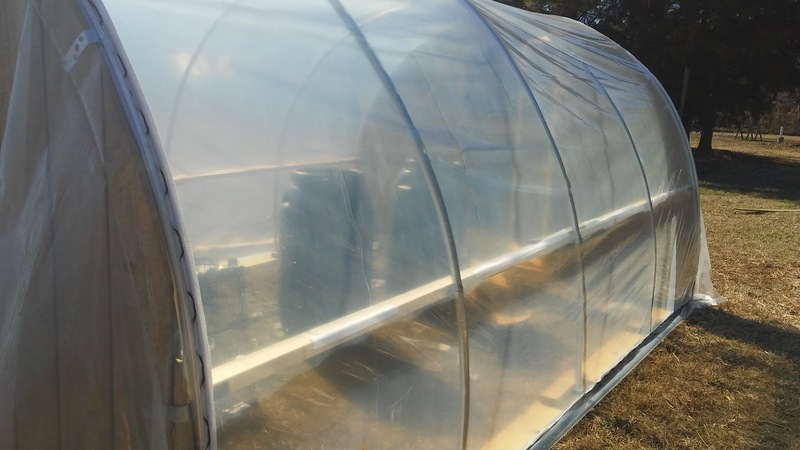 When the hoop house gets too hot, it will automatically open the window to cool things off. That way if we're gone to church or town, we won't bake our little seedlings. Sad news: Ethel the hen is dead. 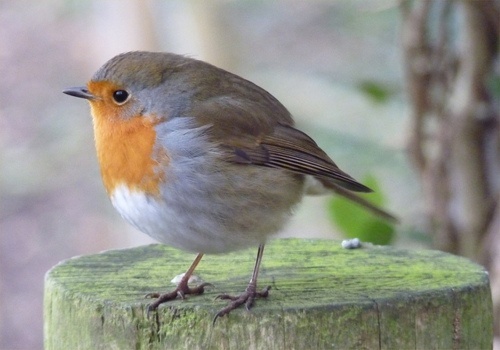 She flew out of the orchard (naughty girl), and Ned got hold of her and worried her to death. It is rather upsetting, not because I was very attached to her. (She was one of my Barred Rocks and the most stand-offish of the hens.) But it's troubling because we must really figure out how we can have chickens on the farm that can somehow coexist with Ned. Clearly we need higher fencing around the orchard. 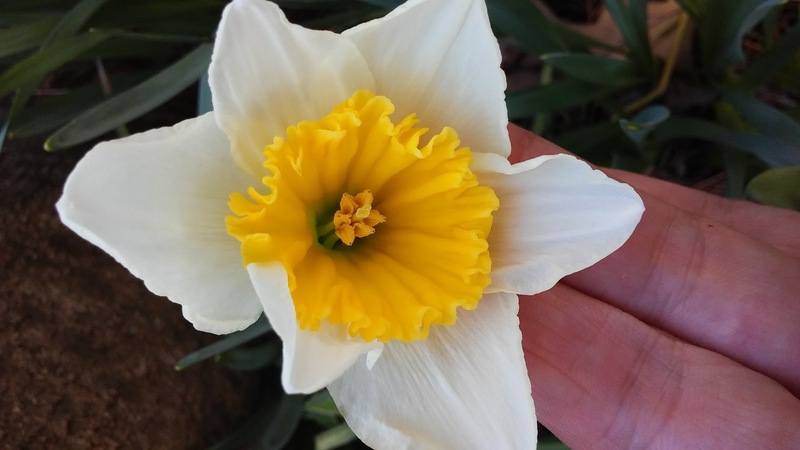 I have about a half-dozen jonquils/daffodils blooming now, hiding under the large fig tree. Day lilies are coming up, as are hyacinths. And one hardy fern has little fiddleheads emerging. My hardy amaryllis also is doing beautifully -- last year's single bulb is shooting up about ten spears this spring! Oh! One more thing. 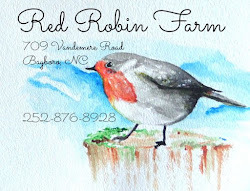 Adam talked yesterday with a young man who grew up in this area and knew the previous owner of our farm, Mr. Mahe, the Frenchman. He was able to tell Adam that the fenced area we're calling the orchard, was never an orchard. It was Mr. Mahe's veggie garden. It was fenced (of course) to keep his miniature horses and donkeys out of it. It did have the espaliered apple trees around the perimeter, as it does now, but the raised rows were never for any fruit trees. Now I feel better that we did not lose fruit trees that never were there in the first place, haha! On a serious note, Adam got a few quotes from roofers for getting a new asphalt roof on our house. 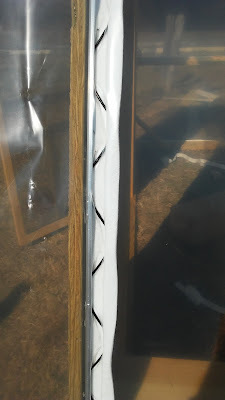 Right now, we simply cannot afford it and must defer a new roof until another year and keep living with the occasional drips from the living room ceiling. It's been 18 months now, and much of the work on the house is "on hold" until we can get the roof in order. But it's a big-ticket item, and at least right now, some medical issues for Adam and me are squeezing the cash out of our budget. We are learning to be patient! The donkeys and horses must have improved your soil! I've just read a lovely book called "Amber's Donkey." It's a true story about a shy donkey that blossomed when it met a little girl with special needs. The little girl progressed amazingly after forming a bond with the donkey. 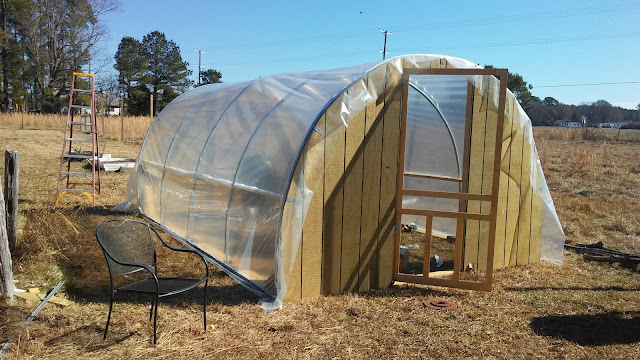 What a great hoop house and I love how the window works. Amazing. Sorry to hear about Ethel. It sounds like spring is starting to happen there with things coming up already. Nice to have a little history on your homestead. Sorry about your roof expense, and about your health issues. I pray all will resolve soon. I would ask the same question as Lisa. 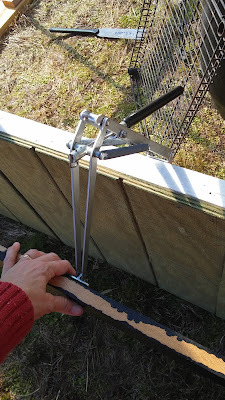 You only have to clip one wing, and then the hen is off-balance and can't fly. This would be much easier than making the fence higher! Sorry about your hen. We've had to train every dog we've ever had about chasing (and killing) chickens. We have Border Collies which naturally want to herd everything and they like to chase chickens. So our solution is to chain up the dog next to the chicken coop for several days, close enough to see them but far enough away that it can't get them. After a few days of that, the dog usually gets sick of chickens and won't bother them anymore. One time we tied the dead chicken around the dog's neck while she was chained out there. It fixed her.